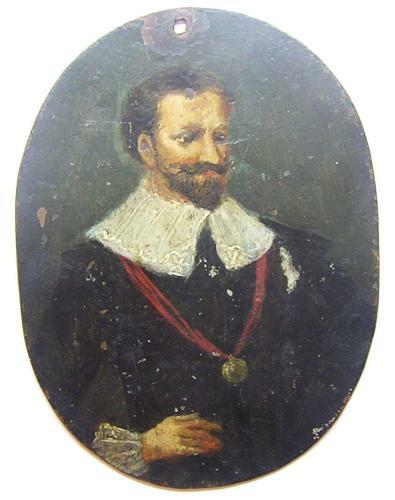 This is a nice and original early 17th-century portrait of an unknown gentleman. It is painted with oils on copper, with a small piercing for a suspension ring (to enable the portrait to be worn on a ribbon). The subject is depicted standing 3/4, rather proudly wearing a gold medal. This may relate to a military commander or reward from the king, it doesn't feel religious but secular and likely a family piece. The condition is good, minor losses to the paint in places and a scuff by the shoulder.